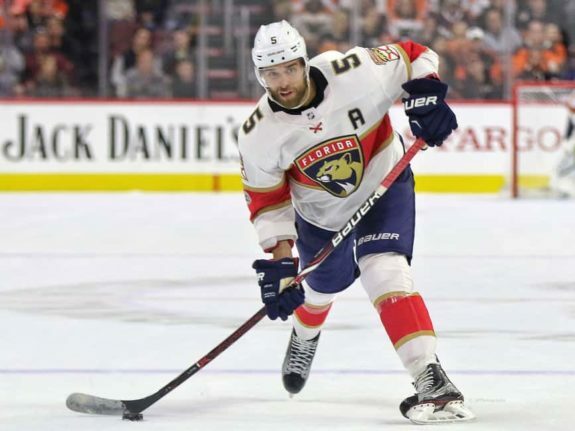 Montreal Canadiens forward Max Domi may not pay financially for his bare-knuckle, preseason punch on Florida Panthers defenseman Aaron Ekblad. He has cost the Habs and their fans a fair bit, though. Suspended for the rest of the preseason for the incident (five games), Domi won’t end up forfeiting any pay as a result (players aren’t paid for the preseason). In contrast, the Habs will lose much more. For instance the Habs lose the opportunity to fine-tune their lineup and get additional looks at Domi as their top-line center. Since he’s been used sparingly as a center in his career, the Habs could have used every opportunity to see what he brings to the table. Granted, he likely wouldn’t have dressed for each of the remaining five preseason games, but the Habs would probably have liked some kind of confirmation they didn’t send Alex Galchenyuk to the Arizona Coyotes for another Andrew Shaw. Of course, the Habs aren’t exactly expected to get off to a roaring start to the season anyway with Shea Weber injured. By most accounts, they’re a long shot to make the playoffs and any harm done to their chances from that perspective will be taken with little more than a grain of salt. It just would have been nice for the Habs to make proper use of the games that don’t count to iron out their lineup. On the plus side, it does give the Habs a chance to give other players, who aren’t guaranteed a roster spot like Domi, more looks in the games he’ll end up missing. It’s kind of ironic, because by all appearances this should be a blemish to the organization. Time and again, Canadiens general manager Marc Bergevin has espoused the need for intangibles like character and attitude in the locker room. He doesn’t look good either as a result of Domi’s indiscretion. It may just be one punch, but it was an unnecessary one thrown in the direction of a player who clearly didn’t want to fight, who has a history of concussions. Thankfully, Ekblad, who was forced to clear the league’s concussion protocol, is okay (so far). That shouldn’t minimize how Domi had nothing to gain from his actions other than a potential Panthers penalty by goading Ekblad into retaliating. Domi got a match penalty instead. If Domi had been looking to ingratiate himself to the Habs and fans after what had been an unimpressive game on his part up to that point (zero shots, 33% in the faceoff circle and a minus-1 rating), it didn’t work. And it shouldn’t be all that encouraging to fans that’s how Domi deals with his frustration in a meaningless preseason game, considering the long season to come. In truth, with regard to the suspension, Domi’s fate was set as soon it had been determined his hearing with the league would be over the phone (instead of in person), as per TSN’s Pierre LeBrun. Nevertheless, the Habs and Domi may take this glorified slap on the wrist as a learning opportunity, even if the punishment doesn’t fit the crime. Some may choose to look at it another way, as if Domi stood up for himself and teammates because of what he had interpreted as cheap shots leading up to the punch. Assuming those same fans wouldn’t be calling for Ekblad’s head were the roles reversed, that argument still doesn’t hold water for several reasons, though. For starters, two wrongs don’t make a right and, if Domi had legitimately been upset at Ekblad for cheap shots leading up to the altercation, boy, did he show him… what an actual cheap shot is. Secondly, plays like that don’t help the Habs. Taking a glove off and punching an opponent who doesn’t want to fight? That’s a penalty every single time. Not only does it give the opponent a man advantage, but, considering the severity of the supposed retaliation, all it does is escalate the situation and lead them to get even. No one wins in that situation. Unfortunately, even though Domi has escaped relatively unscathed, he and the Habs are big losers here. If Domi continues playing (and then not playing) like he did against the Panthers, the Habs will have also lost the Galchenyuk trade hands-down. Domi needs to be better, and not necessarily relative to the guy the Habs got to get him. Hopefully he gets that.